McKinney has, for all intents and purposes, become the Wedding Capital of North Texas, due to our many non-traditional locations, from our unique historic venues to lush and scenic outdoor settings. 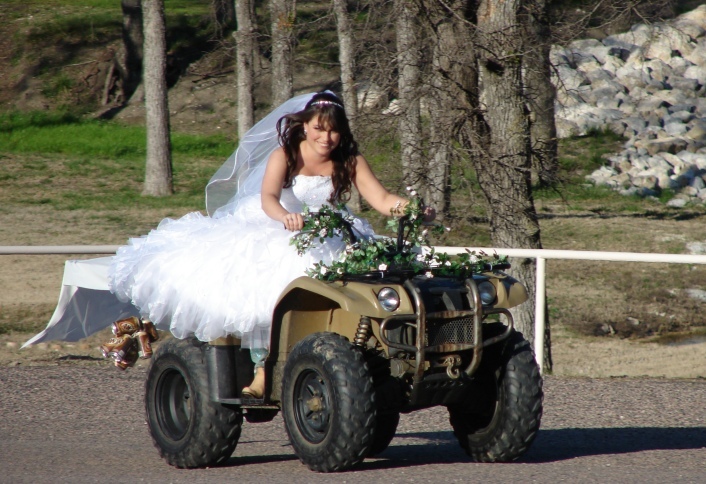 This bride at Myers Park chose to meet her groom at the altar by 4-wheeler. Brides expect Texas summers to be hot, so June, July and August brides often won’t plan much outdoors for fear of melting their wedding party and guests. However, this year, with weather forecasts showing no sign of an end to this heat, brides with September and October wedding dates may be a little nervous about record heat on their big days. For more information about planning a wedding in McKinney, the McKinney Convention & Visitors Bureau staff can help you get started – free of charge – with room blocks, goody bags for your out-of-town guests, suggestions of venues based on guest list size, and more. The certified wedding planner you choose can help you do the rest! Call 214-544-1407 (or tollfree at 888-649-8499), email us at info@visitmckinney.com, or visit our wedding planning page online. Special thanks to Wendy Kidd for her contribution to this blog entry!